Thanks for supporting those who support Chow Down USA! As many of you know, I recently attended my friend’s wedding in Anaheim, California. Anaheim also happens to be the home of Disneyland! My friends and I were lucky enough to stay at the Hilton Anaheim in a Disney room for this trip, which overlooks the park and is perfect for watching the fireworks at night! Truly felt so taken care of by the Hilton Anaheim! Even got some cute Disney items and treats! The Hilton Anaheim also happens to have an extraordinary chef in their Mix Lounge & Restaurant and is located directly next to the Anaheim Convention Center, so it’s absolutely perfect no matter your reason for visiting! As someone who used to go to Disneyland a lot as a child, it was so nostalgic to return and be overlooking the park! They even have a on-site shop which sells Disney merchandise for cheaper than you would find at the park. The Hilton hosted us for an incredible Chef’s Kitchen lunch during our stay. I was truly so impressed with the dishes and presentation created by French Chef Castan, Sous Chef Juan Lopez, and Pastry Chef Raymund Esguerra. These mouth-watering dishes are similar to what you will get to chow down on in their Mix Restaurant in the hotel lobby! Chef Castan is the best! He asked what my favorite place in France was (from my prior trip a couple of years ago), and when I answered Avignon, he said that’s where he was from! Of all the little towns in France, what a coincidence! He’s won a ton of awards, and with good reason. Each dish was a work of art and tasted even better than it looked (if you can believe that)! He even gets some of his herbs from an herb garden on the fifth floor of the hotel. Hiramassa Tataki with avocado and yuzu vinaigrette. Organic Baby Beets with local farm goat cheese, hydroponic greens, and winter truffle vinaigrette. How gorgeous is this plating! Pan-seared Mexican Bass, with naked sea scallops, blood orange emulsion, rapini spread and carrot ginger puree. We all were smitten by the scallops and ginger puree! This Lemon Pound Cake was unreal. It came with black sesame seeds, olive oil, and mixed berries, not to mention crushed lavender! For the Hilton’s 100th anniversary this year, Hilton will host their 19th annual Ducks in Tux fundraising gala. The Anaheim Ducks will all dress up in their tuxes to raise money for the community, and Chef Castan will work his magic to cook for the event! I love a company that gives back! The super swanky Mix Lounge is the first thing you see walking into the high-ceiling lobby. This was packed around happy hour with folks from the conventions! As a game lover, I was happy with the giant chess and connect four area by the pool! You can never have too many palm trees. The California vibe is real here, in the best possible way! 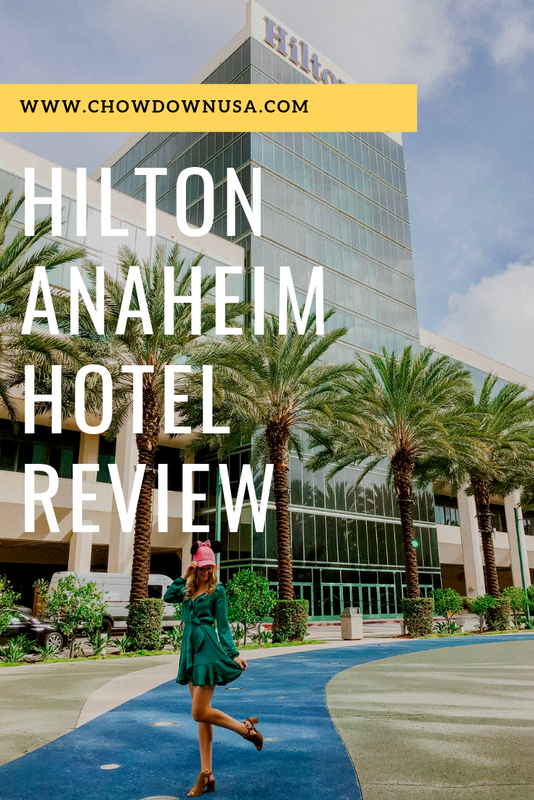 From their stunning palm-tree lined property, to their close proximity to Disneyland and the Anaheim Convention Center, to their mouth-watering and beautiful dishes, I absolutely recommend staying at the Hilton Anaheim! Be sure to check out my other travel guides here!